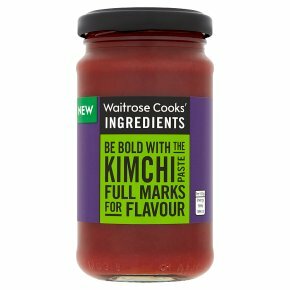 Make your own kimchi in less than ten minutes with this hot and tangy Korean chilli paste. Add to fried rice, pair with minced meat or tofu to create dumplings, or spice up your brunch time eggs with a generous helping on the side. While cabbage kimchi is the most common and a staple in Korean cuisine, served alongside almost every meal, try with other vegetables like pak choi and cucumber for a twist. INGREDIENTS: water, fructose syrup, garlic, dried chilli, yellow onion, sugar, rice vinegar, raw soy sauce (water, soya bean, wheat flour, salt), fish sauce (anchovy (fish), salt), salt, garlic powder, onion powder, acidity regulator (citric acid, malic acid), cayenne pepper. For allergens, including cereals containing gluten, see ingredients in bold. May contain: peanuts and sesame.